Today we spend more time stuck in traffic than enjoying our meals. Shouldn’t food; our very sustenance, be something cherished, savoured and enjoyed with family and friends? RealFoodToronto.com was born out of the passion for food shared by customers at The Healthy Butcher; one of Toronto’s preeminent butcher shops. One frustration was common amongst all customers; not having enough time to spend cooking, eating, and enjoying food to its potential. 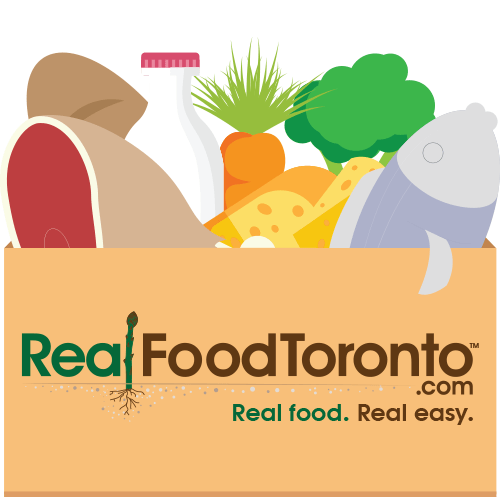 RealFoodToronto.com is a service to enhance your lifestyle. Shop, educate yourself, learn cooking techniques, recipes and more! Buy Toronto’s best ingredients picked by hand, delivered to your front door. Spend less time stuck in traffic, more time enjoying life! The Healthy Butcher is the leader in supplying 100% Grassfed Beef. We always preface “Grassfed Beef” with “100%” for a good reason. Nowadays it seems every butcher and grocery store wants to get “green,” and every butcher seems to be selling grassfed beef. While we are flattered by all the imitation, we encourage you to ask your butcher about just what’s in the beef they sell. You see, lots of places purportedly sell ‘grassfed beef’, but that beef has also been fed a supply of grains or corn to gain marbling. That’s not what we sell. What makes healthy grassfed beef is that they are 100% grassfed. In other words, the beef cows have never been sent to a finishing farm or feedlot to eat grains and corn to fatten up. Within days of eating grains and corn, a beef’s fat and nutritional value plummet. It is no longer grassfed beef. We deal with Ontario’s best grass and beef farmers to offer you stunning Ontario grassfed beef. That said, there is a very limited season for quality Ontario grassfed beef. Believe it or not, Ontario grassfed beef is seasonal just like there’s a season for Ontario strawberries, a season for Ontario tomatoes, and a season for Ontario peaches! In order for grassfed beef to be at it’s best, they need to be eating a steady supply of fresh, green grass on pasture. That can only happen starting in the spring. So, we like to wait until mid summer before bringing in grassfed beef. That gives a chance for the beef to have been roaming on pasture and eating real live grass for a few months before they are processed into yummy, and healthy steaks. Organic animal product is another way to make sure that the meat is healthy. If you’re conscious of what you’re eating, then it is better that you try this one. Keep selling meats like this.